Successfully built and led a professional team, including the recruitment of half a dozen posts. 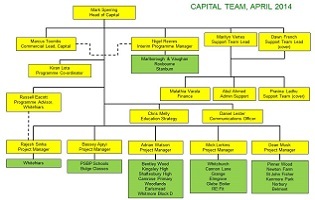 Accountable for strategic oversight of £100,000,000 of capital investment and Programme Management for Education consisting of: Primary, Secondary School Expansion, Bulge, PSPB, Free Schools and Academies. Attending key meetings as Head of Service regarding strategic capital investment with responsibility for a business unit managing 18 projects. Engaging with the DfE and EFA regarding funding and future provision to meet Harrow's statutory obligations. Overseeing a team of 16 direct employees, indirect (matrix) and our external team i.e. Mace and Turner & Townsend. Ensuring the smooth running of Harrow's framework partnership with Keepmoat delivering against our targets.